Appearance: Callum looks the least like his parents of any of the Garcia-Knight litter. The majority of his fur is stark white, though a splotch, so dark a grey as to appear black, covers the entirety of his left ear and then runs down his face, just inside of his left eye and on the majority of the left side of his face, and this same blotch colors a small portion of his mane. In contrast, his eyes are a bright, vivid orange. His fur is short, though not so short as to appear doggish, but his muzzle is slender, favoring his mother's collie and setter ancestry. Callum stands at his full height of 7 feet, 6 inches. He weighs in at nearly 280 pounds in Optime form. In Secui he resembles a small polar bear, standing around 48 inches at the shoulder and weighing about 250 pounds. Lupus form is, of course, the smallest, at 41 inches to the shoulder and 160 pounds. He favors his Optime form for nearly every activity, though if he has to travel a long distance, he takes his Lupus form, and increasingly often will fight in Secui as easily as Optime. Personality: Though his childhood was passed in a fog of laziness, when he got his Mentor, Callum's personality changed for the better. He became driven to succeed, especially after his parents left Casa with Luca and Grynn. Since then, he has remained hardworking, loyal -- perhaps to a fault, and duty bound. He is not so serious that he cannot see the humor in things, but when something needs done he will do it, and do it to the best of his ability. 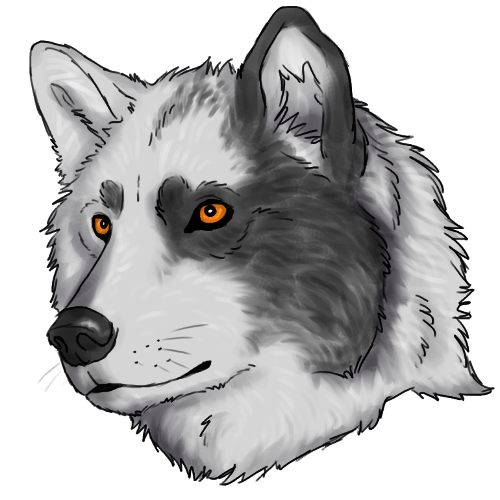 While under normal circumstances, Callum is a friendly giant of a wolf to anyone of any species, those who trespass in pack lands or threaten harm on him or his family should know that will fight to the death, and that if he remains alive, he has a long memory. Cal, at the moment, does not regret the lives he has taken (or helped to end) in battle. He sees each one as a necessary part of his job protecting those he has sworn to protect. Instead, he mourns the lives he could not save. Biography: Callum was born in Casa di Cavalieri in September of 2012 alongside his siblings. He, along with his siblings have weathered the hurricane of late September, gone on several outings with his Da and Grandda, was present for the interaction with Skye that led to Tony's demotion to the Dishonorable rank. In April 2013, he was given Sebastian Auditore as a Mentor. The man did his job well, and taught Callum much about combat with a rapier, leading to him winning his First Blood match just after he turned a year old. Not long after that, Tony and Neela made the decision to do some traveling, with Luca and Grynn in tow. Callum did not have much issue with the "loss" of his parents, clinging to Jazper when he needed direction. In November 2013, Callum asked permission of Zalen Damaichu to court his daughter, Veyra, the girl having told him that her father was making her see guys in the hopes she'd choose a mate. What began as a platonic effort to give her someone she knew to "date" turned into puppy love and quickly into genuine love. He tangled with Vidar over the right to become Veyra's mate in February of 2014, and though he technically lost, Veyra chose Callum over Vidar. They continued to see each other for the next several months while Callum worked on his rank in Casa. By June, Cal ranked as a Corpo, sat his vigil, and then took his Brotherhood Oath as well as oaths to his new mate. He returned to New Dawn as a symbol of an alliance, and began to acclimate to his new home. He was ranked as an Epsilon: Warrior. Within the first few days of moving there, got the chance to prove his worth, protecting the Alphess, who was patrolling despite being in heat, from an unsavory loner. He and Lucia laid the male low, and Callum later returned to kill the man rather than leave him to suffer. Life was relatively normal after that, till Veyra's first heat post-mateship. They bred, and at the end of August she gave birth to four male puppies. Callum was smitten, and endeavored to be a good father to his boys. Despite his efforts, it became apparent that Quin and Eros would be troublemakers through and through. Cal and family traveled to Casa di Cavalieri in October to show the pups off to his family there. In early 2015, a sickness spread across New Dawn, unwittingly gotten from the bones of an orca that the pack had killed before he joined them that had since rotted away. Callum helped drag them into the ocean, and so was one of the Patient Zeroes. Though he pulled through, not everyone was so lucky: Zalen was dead, apparently as a result of having walked off a cliff in the throes of the sickness. By summer, Raeka, who had never fully recovered from the sickness itself and the death of her mate, joined him, leaving the pack to Kiara. Kiara's reign would be short-lived, however, as the misfits of Anathema, swayed by Kohaku's desire for revenge against his birth mother and under the impression that one of their own was being held captive in New Dawn, came to attack the pack as they slept in the communal den, mid August 2015. There were no Anatheman casualties, and very few casualties in New Dawn, though Altair and Callum were both badly injured, as was Kiara. Callum recuperated with his family in Vinatta for a few days, then insisted that they move on to Casa di Cavalieri, sure that the pack of knights could do something. Alistair mobilized the Brotherhood and Callum made shift to march with them, but Luca, concerned about Callum's injuries, drugged his brother to prevent his attendance.